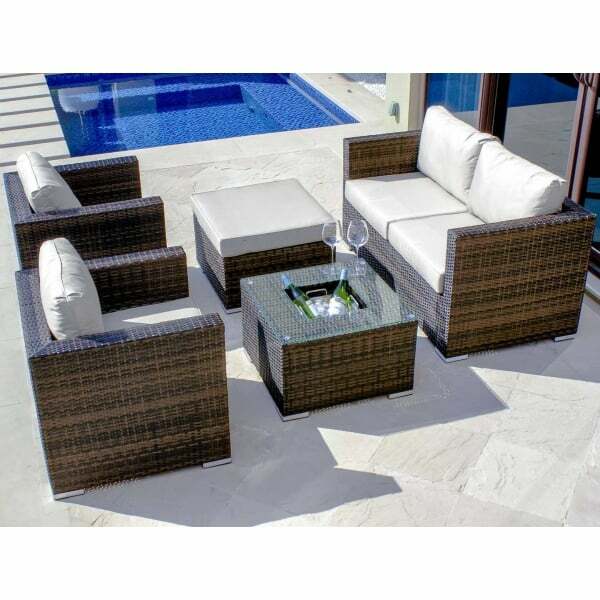 This Maze Rattan 5 piece sofa set is ideal for use either indoors in a conservatory or outdoors on a patio or in the garden. The attractive 2 seater sofa and 2 armchairs include comfortable and supportive padded seat and back cushions and the matching footstool which can be used to aid relaxation or to provide extra seating also features a padded matching cushion. A stylish square glass topped table with an integrated ice bucket, which is ideal for those drinks parties, completes this versatile set. Available in a choice of colours, the flat synthetic rattan weave weatherproof and easy to clean, simply use warm water and a mild detergent to remove any stains. The sturdy aluminium frame is rust resistant and this set comes with a 1 year manufacturuer's warranty.